Bang bang shrimp at Bonefish. Artichoke Pizza at The Loop. A blueberry muffin top at Atlanta Bread Company. This has been a seriously dull food week here in Tally. But earlier today, while strolling through the local CVS, I spotted them. Five beautiful, marshmallowy, sugar coated, peeps. As much as I wanted to bring them back to my desk to savor for the remainder of the afternoon, they didn't make it past the car ride back to the office. Every other childhood treat I once loved has failed to hold up to its memory. I used to crave Nestle Crunch, Twinkies, Ding Dongs, McDonalds Apple Pies, Soft Batch Cookies. One by one, I've tried them again in my adult life, and winced in pain at the sheer awfulness. These things are off the list, for good. But Peeps made it. I love the rough feel of the sugar on my tongue combined with the soft give of the marshmallow. I love that they look almost random - like someone switched on the marshmallow spewing machine and said - "hey, that thing looks like a chick!" I love the unadulterated sweetness. I love their little brown dot eyes. I love the size - just bigger than a bite, but not so big that the pleasure fades before you're through. This isn't to say there's not limits; there is such a thing as getting over-Peeped. Two years ago, when word of my predilection was leaked to my clients here, I started to get mystery boxes delivered to my cube in Tallahassee. I'd walk in on Monday afternoon to find a small stack of Peeps Christmas trees, Pumpkins, bunnies. And I found that when faced with a mountain of Peeps it's hard not to just see them as a 5 pound bag of sugar. But I took this year off - save for a couple of quick nibbles at Christmas - and the magic is restored. 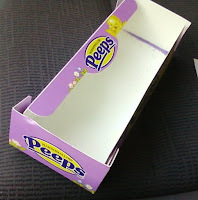 The first box of Peeps, like a crocus poking its head up from beneath the melting snow, like the green warm breeze, like a birdsong - proof that Spring is here. For a seriously good time, try putting a peep in the microwave. I've added your blog to my "snob" tab on netvibes, between "big cheese stories" and "the blog of the ghost of koko goldstein." alas, harold mcgee doesn't have an rss or atom-based blog. All is well here in Philly. a) I'm not sure I could bring myself to willfully torture a Peep, but I think I can make an exception. b) A spot on the snob tab of Mr. Stirman is not easily gained; I'm honored, sir. c) Netvibes rocks - hadn't seen it before.